Let’s move on to what people experience during an Akashic records reading. 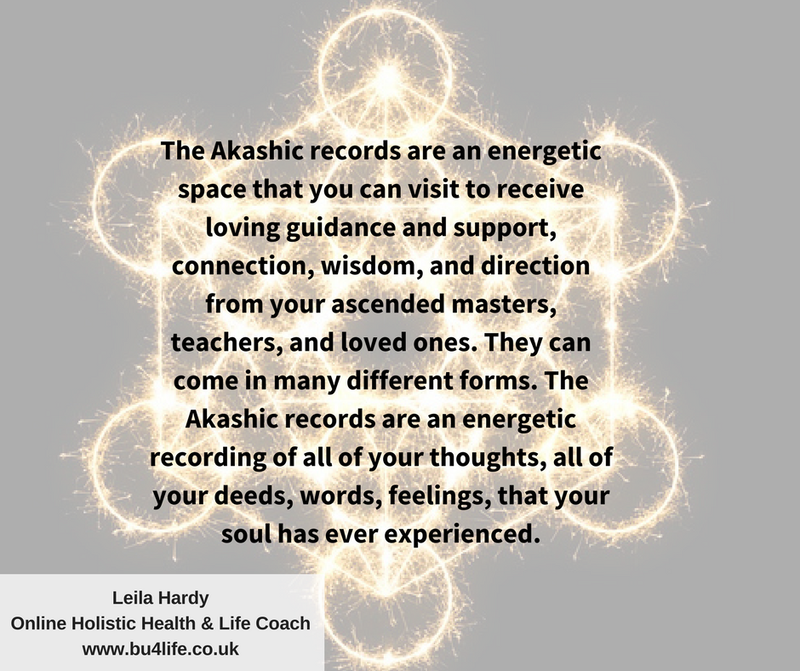 What do most people experience when they have an Akashic records reading with me? In most of my sessions most people experience clarity, warmth, relaxation, real strong sense of love and connection, gratitude and appreciation for the insight and the wisdom that’s been brought forwards for them to be able to access, lots and lots of healing, thought provoking questions. As I said, they will often be quite conversational in the way that I access the records which allows almost like a two-way conversation. That allows you to really start to understand what they’re trying to tell you and what they’re putting across to you in the most powerful way so you can integrate it, so you can take it away with you and work with it to allow you to have the health and happiness that you want. Other than having this powerful two-way conversation with the masters, teachers, and loved ones, these feelings of warmth, clarity, gratitude, appreciation, being prodded to think deeper, to think more about what it is that you want, what guidance you’re receiving and why, it’s really powerful. It really helps you to get more and more clarity when you have that almost two-way conversation. That may be because I channel some of the information from the masters, teachers, and loved ones, which allows you to have that conversation. Other practitioners may be slightly different. You leave with this brilliant full understanding of what it is that you need to do that feels empowering. It feels like you’re able to take aligned action or you’re able to take that direction and work with it. That personally is why the Akashic records have been so powerful for me. I love to use that information to empower people, to help them realize why there are obstacles in their way, but what their potential is to look forward to and what there is for them to move forwards once they move through the zigzags that life has provided for them up to this point. Often, people receive gifts from their masters, teachers, and loved ones in the records. Occasionally, the information is a bit cryptic and it’s only been in hindsight that we’ve been able to look back at that and realize how powerful that was at the time. We didn’t completely know it at the time because we didn’t completely understand what the end piece of information they wanted to give the client was. It’s very simple to ask them if they want us to share the information about it or not, and it’s very clear when they say it’s left for the client to work with. Masters, teachers, and loved ones sometimes or often won’t identify themselves. The reason for that is because as spiritual beings, they’re almost limitless. They’re almost identity-less as well. And of course when we attach to an identity, we are starting to bring that into the physical form. Sometimes it’s just not possible. The masters, teachers, and loved ones really want to express that you can have the most powerful connections, the most deeply meaningful guidance being received, and it doesn’t have to come in the physical form. It really allows you to touch that spiritual side of you, that opportunity to work with energy and the things that you can’t see, and allows you to stay free of attachment and stay open-minded, open-hearted to receive the information knowing that it hasn’t come from somebody specifically or a particular angel, ascended master, teacher, or anything like that. It allows you to really work with it without any judgement, without any pre-judgement and pre-expectations. Masters, teachers, and loved ones in some of the cases I’ve done readings for people, have been quite humorous. They can be quite light-hearted. They can be quite cryptic and playful. For me, when that happens, I think it’s just really allowing them to get that message across to you that life doesn’t have to be hard. It can be quite jovial. You can look at life with a deep curiosity and it allows you to do that. Literally, mine started really stern with me so as I was accessing the records and working with them, doing some journaling and asking lots of questions, exploring them, I was getting the feeling like I was being told off a lot. But actually, as I really started to explore why I was feeling that in the records, they started to lighten up. Now they can make me laugh out loud. It’s quite unbelievable what they’re able to bring to the table when I’m asking them questions. It not only helps me and leads by example to help me lighten up because I’m generally quite a serious person, but it really shares the most incredible wisdom that comes when you have a light heart and a curiosity about life. I love that. It’s so exciting. How does insight and guidance within the records look for me? When I am connecting with somebody and doing a reading, I see images, I see words, just single words sometimes, and then I’m also able to convey that conversation out loud through channeling, through voice. I often feel the feelings as well and the emotions. The power of the emotions that the masters, teachers, and loved ones want to convey over to you can often come through me in that way as well. That’s incredibly powerful, not only for me to be able to have that ability to be able to share that with you in such a powerful way, but also to have you receive that information in such a powerful way as well. Wow that’s a lot of information. Let’s quit here for now! Be sure to come back for the final part in this series on what the Akashic records are and why they are used. If you have any questions about using the Akashic reocrds or how they can benefit you, don’t hesitate to ask me.